NASA postponed launching a spacecraft to Mars on Thursday after a glitch popped up in the computer software used for monitoring the fueling of the rocket used for liftoff. The problem with sensors and software that measure the amount of fuel being loaded into the rocket appeared with just minutes left until liftoff. Two days after bringing Discovery home, NASA rescheduled the launch for Friday morning. The Mars Reconnaissance Orbiter was expected to spend at least four years circling Mars. The spacecraft is equipped with new tools designed to gather more data on the planet than all previous Martian missions combined. The Mars Reconnaissance Orbiter is expected to collect information that will help NASA plan where to land two robotic explorers later this decade and possible future human exploration of the Red Planet. 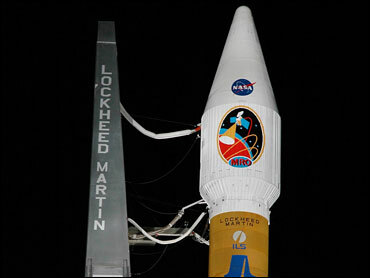 The Phoenix Mars Scout, in search of organic chemicals, will be launched in 2007, and the Mars Science Laboratory will follow two years later. "We don't want to be hauling cement to Mars. That's very expensive," said project scientist Richard Zurek of the Jet Propulsion Laboratory in Pasadena, Calif. "Better to know what we can make on the surface of the planet." Early morning thunderstorms delayed fueling of the rocket launching the orbiter and pushed back the time of the liftoff by at least an hour Thursday. The two-ton orbiter, equipped with the largest telescopic camera ever sent to another planet, will provide unparalleled information on Mars' weather, climate and geology. The $720 million mission is also expected to help build on NASA's knowledge of the history of ice on the planet. The planet is cold and dry with large caps of frozen water at its poles. But scientists think it was a wetter and possibly warmer place eons ago — conditions that might have been conducive to life. Scientists are also trying to determine if it could support future human outposts. "With the subsurface of Mars, we've literally just scratched the surface and we're trying to probe, now, more than a couple of feet into it," Zurek said. CBS News Correspondent Jerry Bowen reports that earthlings are thinking of using the same toxic stuff already blamed for global warming here to put some life back on Mars. "What we propose is to use greenhouse gases – the same ones that are currently on the earth causing climate change," said Margarita Marinova, a graduate student at the California Institute of Technology. Marinova says that the goal is to warm Mars enough so that the planet's south polar cap will evaporate. The orbiter will join three other spacecraft, including a European orbiter, when it arrives at the planet in March 2006. Two NASA rovers launched in 2003, Spirit and Opportunity, also continue to roam the planet, providing information water on Mars. With more instruments and higher-resolution imagery, the larger Mars Reconnaissance Orbiter will be able to offer a more comprehensive sweep of the planet and send back more data than the other orbiters, said project manager Jim Graf of the Jet Propulsion Laboratory. It has a powerful antenna that can transmit 10 times more data per minute than the current trio of satellites positioned around the planet — NASA's Global Surveyor and Mars Odyssey and the European Space Agency's Mars Express. The orbiter is also loaded with two cameras that will provide high-resolution images and global maps of Martian weather, a spectrometer that will identify water-related minerals and a radiometer to measure atmospheric dust. The Italian Space Agency has provided ground-penetrating radar that will peer beneath the surface of layers of rocks or ice. "They're bringing their data back, we think, through a straw," Graf said of the current orbiters. "We're going to start opening up the fire hose ... We're going to be awash in data that will allow us to better understand the planet as a whole."